If your business sells tangible products, you need to have a strong online presence. But with so much competition in the ecommerce space, it can be tough for you to establish your ground. Not only are you competing with local and regional brands, but you also have to deal with international giants such as Amazon and Walmart. That’s why it’s important for you to focus on every detail of your ecommerce website. Learn how to design a homepage that converts. This guide is useful to everyone. Whether you are a brick and mortar retailer expanding into online business, a company that operates strictly through the Internet, or something in between, you’ll benefit from these tips. It doesn’t matter whether you’re building a new website or making changes to your existing one. Following these 21 best practices will help you increase conversions for your ecommerce store. You’ll also be able to generate more leads and add additional sales revenue to your bottom line. Ecommerce websites with simple designs have higher conversion rates. Take a look at your homepage right now. What’s the first thing a visitor sees? There should be a clear point of focus. The visitor’s eyes should be drawn straight to a CTA button or products you sell. But too much clutter makes it difficult to identify your CTA. 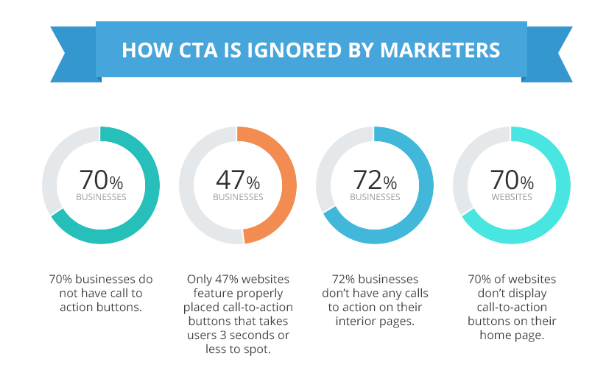 As you can see, 53% of websites have CTAs that take visitors more than three seconds to locate. You should be aiming for a time much quicker than that. What actions do you want consumers to take when they visit your website? Obviously, you want them to make a purchase. Make this as easy as possible for them. Don’t distract people with clutter. It’s overwhelming and confusing. Menus are a great way to stay organized and group what you’re selling. But as just mentioned, you don’t want to overcomplicate things. Too many menu categories will confuse the consumer, preventing them from finding what they’re looking for. Your menu shouldn’t be super specific. Instead, use broad terms to categorize your products. Let’s continue talking about simplicity. Now that you’ve removed some clutter and simplified your menu options, you’ll still need to make additional changes. Since visitors will have fewer menu selections, they’ll see more products when they click on each category. I know some of you may not have a ton of products for sale, but other ecommerce sites could have hundreds or potentially thousands of options to choose from. Forcing users to scroll through these choices randomly won’t drive sales and conversions. That’s why implementing a search bar is the best solution. The company sells thousands of sneakers on its website. A search bar makes it easy for its customers to find what they’re looking for. Take a look at what the search for “running sneakers” yielded in the example above. As you can see, there are 155 products that fit this description. That’s still an overwhelming number of items to scroll through. But Nike has additional filters and search results on the left column of its search feature. This helps customers narrow the options based on parameters such as gender or sport. If you use this strategy, make sure all your products are clearly tagged with the appropriate labels. Then the search results will be accurately displayed for each shopper’s query. Speed is one of the most important elements of a successful ecommerce website. Each page needs to load fast to yield high conversions. But if you buy a budget web hosting plan, it’ll cost you in the long run. Research shows a one second delay in page loading time can lead to a 16% decrease in customer satisfaction and a 7% loss in conversions. If your site has a two or three second delay, you’re in big trouble. Even worse than a slow loading time is site crashes, glitches, or error reports. That’s why you’re better off spending the money on a premium web hosting plan now as opposed to dealing with these headaches later. Trust me, it’s worth the investment. Once a website visitor decides to buy something, they should find it easy to complete the purchase. It’s your job to make it so. Each additional step in the checkout process will increase the chances of them abandoning the transaction. In fact, 28% of consumers said they abandoned a shopping cart during checkout because the process was too long and complicated. The key here is to get only essential information from the buyer. There’s no reason to ask for their mother’s maiden name, the first concert they attended, or their favorite vacation spot. Get their billing information and shipping address. That’s all you need to process a transaction. As I just said, you want your buyers to go through the checkout process as quickly as possible. That’s why you need to offer a guest checkout option instead of forcing visitors to create a profile. That said, you can still encourage them to create a profile. Once items are added to a shopping cart, users can finalize their transaction through the guest checkout option. But that doesn’t mean Lululemon is done trying to encourage people to create a profile. When the order is being reviewed, guests can see an express checkout button, but they can’t use it. This option is reserved for customers who set up profiles. They can go through the checkout process even faster since all their information is saved in their accounts. Subtle features like this encourage profile sign ups without being annoying or putting too much pressure on the customer. Once a user sets up their profile, you can tell when they add something to their shopping cart without buying it. Don’t ignore this. You’re missing out on money. Often times, they were just a click or two away from completing the transaction. Clearly, they were interested in the product enough to add it to their cart. Sending an email reminding the shopper about the item can be just enough to finalize the sale. Not everyone who wants what you’re selling will navigate straight to your website. In fact, research shows that 46% of consumers start the buying process through a search engine, such as Google. If your ecommerce site isn’t one of the top results, they’ll buy from one of your competitors instead. That’s why it’s so important for you to focus your efforts on search engine optimization. Do everything in your power to reach the top of Google rankings based on searches related to whatever your brand is selling. How often will the same person visit your ecommerce website? Chances are, they’re not buying something every day. They probably won’t buy something even once a week. Only your top customers might shop once per month. If people aren’t on your website, they obviously can’t spend any money. But running a blog in addition to your ecommerce site is a great way to build a strong following. Now people have a reason to check out your site on a daily or weekly basis. Once they’re on the site, they’ll be more likely to buy something. To have a successful ecommerce site, you need to have lots of visitors ready to buy. But how are you planning on driving traffic to your site? Building an ecommerce email list is one of your best options. Once you have a subscriber’s email address, you can contact them with special offers and promotions to entice sales. By default, this box is already checked off. Shoppers will have to deselect this option if they don’t want to be added to the subscriber list. Once people are added to your list, it’s the perfect opportunity for you to send them personalized offers to drive traffic to your website and increase sales. You can even offer an incentive for shoppers to sign up for emails, such as a discount off their next purchase. You can’t assume everyone has a Visa or MasterCard. Even if they do, that doesn’t mean it’s their preferred payment option. One of those cards may be maxed out, or they could have better membership benefits on another card. Even if other credit card companies charge higher merchant transaction fees, you still need to take other cards like Discover and American Express. Your ecommerce site also needs to accept alternative payment options such as PayPal and Apple Pay. You can’t sell something with just a name. Each product on your website needs to have an informative description. But make sure you avoid large blocks of text. Keep these descriptions short and to the point. Explain how the product works by highlighting the key benefits. You don’t need to explain the entire history of the product or how it was made. That won’t drive sales. You can even use bullet points to make it easy for consumers to scan through the text and read the description. Some of you may be using your ecommerce site as a platform to sell advertisement space to other brands. Don’t do it. You’re making a big mistake if you do. Sure, you may get some additional income. But it’s not worth turning away your own customers. Sidebar ads and popups can look like spam. A visitor may be afraid to click through your site for the fear that they’ll be redirected somewhere else that’s untrustworthy. As you can see, 82% of consumers in the United States say that online ads are disruptive to their shopping experience. Remove any ads you have, and leave it as blank space. This will help you eliminate the clutter in your design—the point I discussed earlier. Not all of the transactions on your ecommerce site will go smoothly. Customers will have questions and problems. This is inevitable. When people are experiencing an issue, such as finding a product or troubleshooting an item they have previously purchased, you want to make sure they can get help as soon as possible. Now customers can contact your brand based on their preferred method of communication. In addition to your customer service being easily accessible, it also needs to be friendly. Don’t keep customers on hold. Make sure your staff are trained to resolve issues quickly and efficiently. How do you know if your ecommerce site is set up for the highest possible conversions? But if you run A/B tests on a regular basis, you’ll have a much better understanding. Now you can adjust the CTA placement, its phrasing, or button color. Determine which landing pages are driving the most sales. Based on the results of your tests, you can make the necessary adjustments, increasing the chances of your success. Your ecommerce site needs to be optimized for mobile devices. That’s because in the last six months, 62% of people who owned a smartphone used their devices to complete online purchases. You can’t afford to exclude mobile shoppers. If you want to take your mobile strategy to the next level, you may even want to consider building an app for your ecommerce business. This is the ultimate way to personalize the consumer shopping experience. Plus, you can save user information on file, such as their payment options and shipping address. Now they can check out and complete each purchase in just a few clicks as opposed to having to enter their credit card for every transaction. It’s simple: don’t charge your customers for shipping. That’s because unexpected costs are the top reason for shopping cart abandonment. Put yourself in the shoes of a consumer. They see a price listed on one page of your website, but at checkout, they see additional charges. Sure, they can expect to pay taxes, but shipping too? These added costs are driving people away. Increase the prices of your products to cover any shipping costs incurred by you as opposed to charging for shipping separately. Establishing credibility is one of the best ways to drive sales and have a successful ecommerce website. Having a celebrity or someone with a strong social following endorse your site will make you seem more legitimate. This marketing tactic won’t be free, but it can definitely yield a high ROI. Just make sure you’re working with someone related to your industry. If you’re selling skateboards and related products, having an influencer who has never skateboarded won’t have much of an impact on your sales. Having an ecommerce shop means customers don’t get to touch and feel the products the same way they can in a physical store. They rely on pictures to give them a sense of what they’re buying. That’s why you need to take multiple pictures from every angle of each product you’re selling. I know this may seem tedious, but it’s necessary. Zoom in and highlight all the top features and benefits. If you’re selling something requiring a demonstration, add a video. According to Forbes, 90% of consumers say videos help them make a decision about purchasing a product. In addition to its high quality photos and product descriptions, the site also has video demonstrations for the majority of items they sell. This added information makes it easy for prospective customers to learn how each product works. Testimonials and reviews are another way to add credibility to your products and brand. It’s important that you include these on your ecommerce site. After a customer buys something, send them a follow-up email asking them to review the item they bought. Just make sure you give them enough time to use it before you ask for their feedback. I realize this can be scary for some of you. Not everyone will be happy with your products, and the idea of negative comments being publically displayed can be frightening to some brands. But that’s OK. Don’t let a few bad reviews discourage you. Look on the bright side of it. This will show shoppers the reviews and testimonials on your site are legitimate and trustworthy. A couple of negative remarks can make your positive reviews appear that much more powerful. Running a successful ecommerce website is not an easy task. Fortunately, you can do many things to improve your chances of driving sales and keeping your customers coming back for more. Don’t let this list of best practices intimidate you. I don’t expect you to implement all 21 of these overnight. That said, you should start to identify changes that need to be made and prioritize the ones you think are the most important. What elements of your ecommerce website need to be adjusted to improve your conversions rates and drive more sales?